Aghaalikhani, M., Roozbahani, A., Omidi, A. (2014). Study of the Effect of Biofertilizer Application to Water Stress Affect on Yield ,Yield Components and Oil Percentage of Safflower (Carthamus Tinctorius L.). International Journal of Advanced Biological and Biomedical Research, 2(Issue 4 (2)), 111-119. Mahdi Aghaalikhani; Arash Roozbahani; Amir Hassan Omidi. "Study of the Effect of Biofertilizer Application to Water Stress Affect on Yield ,Yield Components and Oil Percentage of Safflower (Carthamus Tinctorius L.)". International Journal of Advanced Biological and Biomedical Research, 2, Issue 4 (2), 2014, 111-119. Aghaalikhani, M., Roozbahani, A., Omidi, A. (2014). 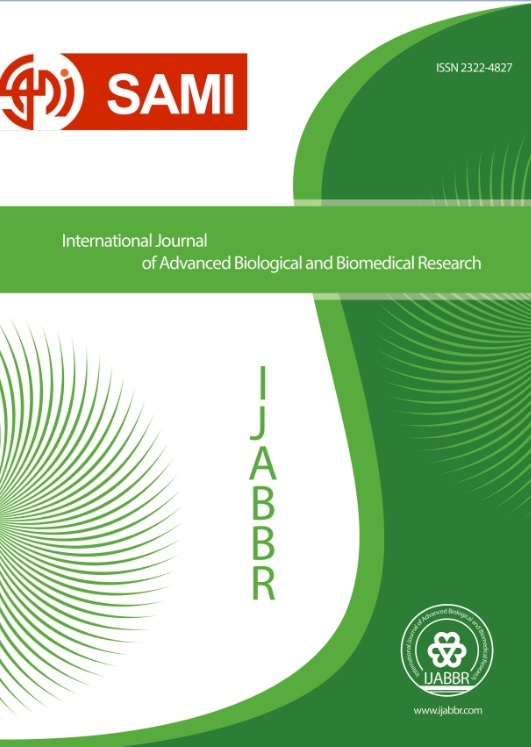 'Study of the Effect of Biofertilizer Application to Water Stress Affect on Yield ,Yield Components and Oil Percentage of Safflower (Carthamus Tinctorius L.)', International Journal of Advanced Biological and Biomedical Research, 2(Issue 4 (2)), pp. 111-119. Aghaalikhani, M., Roozbahani, A., Omidi, A. Study of the Effect of Biofertilizer Application to Water Stress Affect on Yield ,Yield Components and Oil Percentage of Safflower (Carthamus Tinctorius L.). International Journal of Advanced Biological and Biomedical Research, 2014; 2(Issue 4 (2)): 111-119. In order to study the effect of bio-fertilizers in decrease the effects of water stress on yield, yield components and oil percentage of Goldasht spring safflower cultivars (Carthamus tinctorius L.), an experiment on split plot in a randomized complete block design with three replications was carried out in 2012 at the Agricultural Research Station of Islamic Azad University of Roudehen branch .In this experiment, the main plot was water stress treatment consisted of four levels (optimum irrigation, cutting of irrigation at flowering, cutting of irrigation at seed formation, cutting irrigation at in two stages of flowering and seed formation) and bio-Fertilizers treatment as subplot consists of four levels (no fertilizer, consumption of nitragin bio-fertilizer, consumption of seaweed extract and seaweed extract and nitragin biofertilizer respectively). Data were analyzed by SAS program of analysis variance and means at the 5% level LSD tests were compared. The results showed the effect of drought stress and biofertilizer treatment on traits such as number of seeds per boll, seed thousand weight and yield at 1% level was significant and effect of treatments on. Between stress levels, the highest yield and yield component losses for most traits and between levels 2 and the highest yield stress was observed in the control treatment (optimum irrigation) Also, between the used levels of biofertilizers, nitragin with seaweed extract produced the highest yield and usage of of nitragin was better than algae extracts and in the control treatment had the lowest yield. Finally effect of different levels of biofertilizers and different level of drought stress on plant height, chlorophyll b, number of seeds per boll, seed thousand weight, oil percentage and yield in 1% probability level and on the boll number per each branch in 5% probability level was significant. At the end, 2 times stress has greatest losses and nitragin with seaweed extract has highest level in yield and yield components. So in this area and similar areas can reduce the side effects of drought by using biofertilizers.